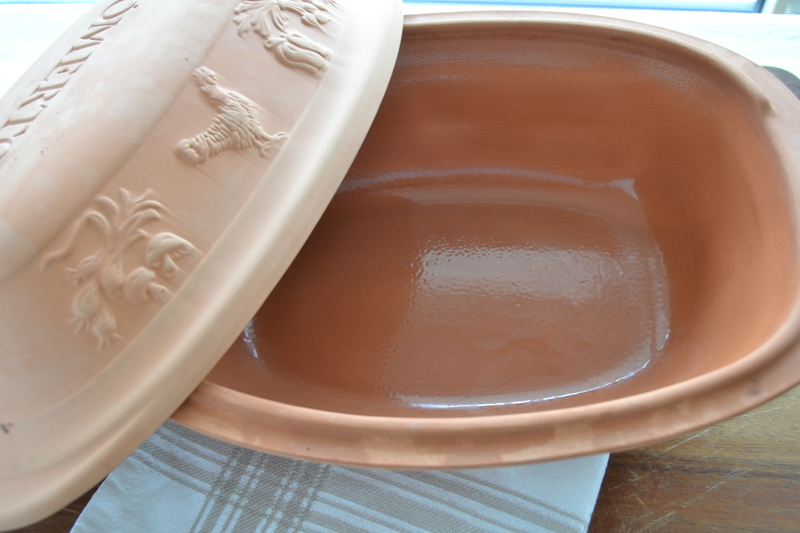 A couple of weeks after moving to Switzerland my attention was drawn to a beautiful, rustic looking , Romertopf clay pot. Cooking in clay is one of the oldest methods of preparing food and I am a big fan of slow cooking, so i decided to buy it and try-it-out, because it wasn’t that expensive. The one I bought is partially glazed. It is recommended to soak the pot in water 10 -15 min before each use. My first experiment was with chicken, later I will try with other meals. I like it served with a crunchy kohlrabi salad. Soak the clay pot in water for 10-15min. Season inside of the chicken with salt and pepper and put two springs of thyme. Smear a little butter all over the chicken and season with salt and pepper. Put the potatoes and the carrots in a bowl and cover lightly with oil and season. 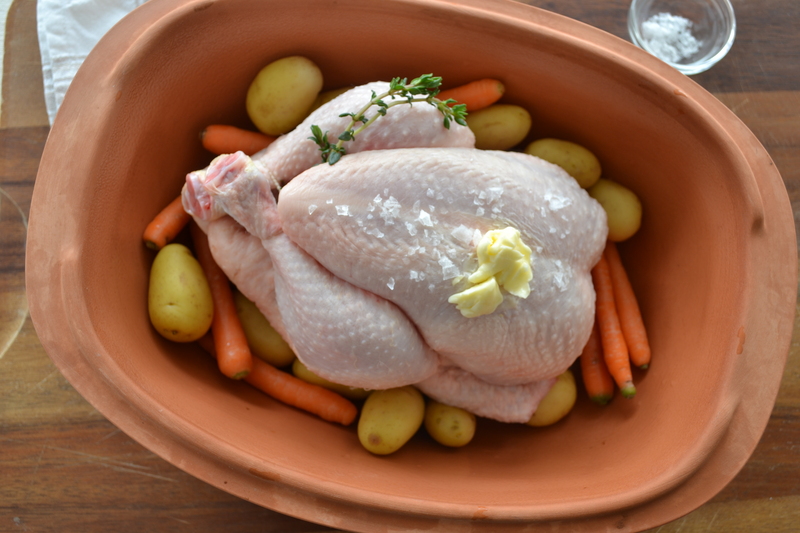 Place chicken in the clay pot and surround with the carrots and potatoes. You don’t need to add any liquid. Close the lid and put in a cold oven. Turn the oven to 180C/350F/gas mark 4. Cook for one hour and fifty minutes. Check is it done by making a small cut to see if the juices run clear. If not cook for an additional couple minutes. Do not place the hot clay pot on a cold surface, I place it on a wooden board. 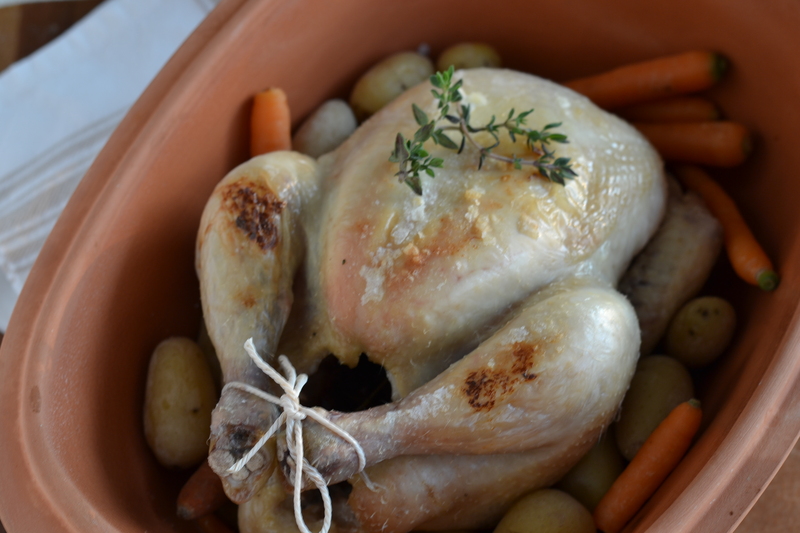 Don’t tie the legs, the chicken will cook more evenly, you can tie them later for presentation. You can cook the baby carrots separately. It will add better color to the dish. Put the carrots into cold water and cover. Slowly bring to boil and reduce to simmer. Cook until tender 7-8 min and pierce with a knife to check if ready. 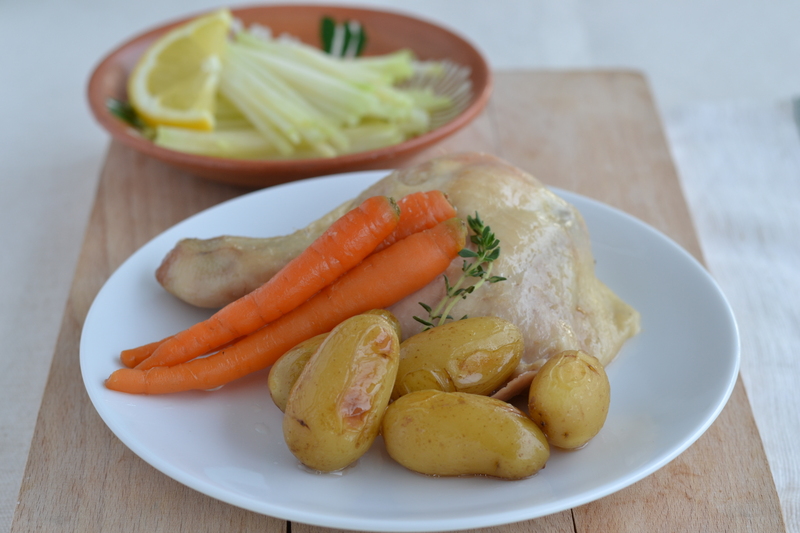 Drain and serve with chicken and potatoes. Make the dressing. Whisk olive oil with little bit of salt and pepper. 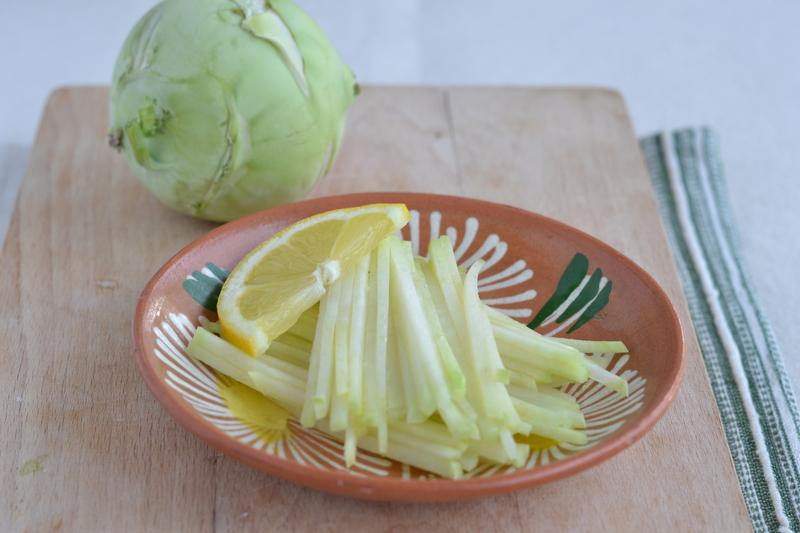 Peel the kohlrabi. Use a mandolin to get thin slices, and then cut them into matchsticks. Lightly spoon dressing over kohlrabi, and toss to coat well.